Foreground: The clip to use as foreground. Background: The clip to use as background. Middle: Optional. The clip to composite between the Foreground and Background. Mid_Matte: Optional. The alpha channel of this input specifies the opacities of the Middle input. If this input is not provided, the alpha channel of the Middle input is used instead. This input can be affected by the Invert Matte or Matte Use parameters. Defocus Foreground: Default: 0.088, Range: 0 or greater. Defocus Middle: Default: 0, Range: 0 or greater. The amount to defocus the Middle and its Matte. Disable this if you have provided a separate Matte input and the Foreground pixel values have not been pre-multiplied by this Matte. Determines how the Foreground or Matte input channels are used to make a monochrome matte. Show Fg Defocus: Check-box, Default: on. Turns on or off the screen user interface for adjusting the Defocus Foreground parameter. Its value should first be made positive to adjust this more easily. 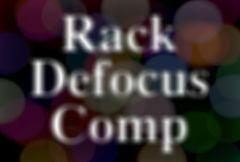 Show Bg Defocus: Check-box, Default: on. Turns on or off the screen user interface for adjusting the Defocus Background parameter. Its value should first be made positive to adjust this more easily.